The grindstone for woodworking tools is best when rather fine and soft. The grinding surface should be straight and never concave. The stone should run as true as possible. It can be made true by using a piece of 1″ gas pipe as a truing tool held against the stone when run dry. 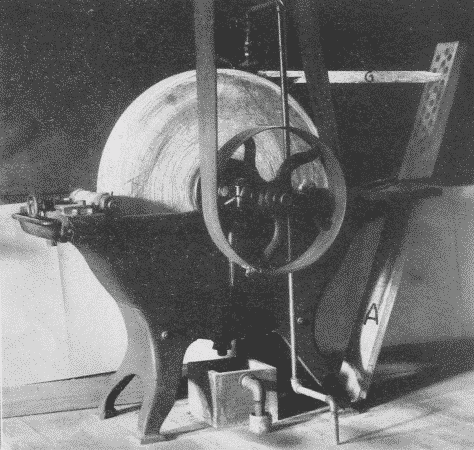 Power grindstones usually have truing devices attached to them, Fig. 221. A common form is a hardened steel screw, the thread of which, in working across the face of the grindstone, as they both revolve, shears off the face of the stone. The surface should always be wet when in use both to carry off the particles of stone and steel, and thus preserve the cutting quality of the stone, and to keep the tool cool, as otherwise, its temper would be drawn, which would show by its turning blue. But a grindstone should never stand in water or it would rot. It is well to have the waste from the grindstone empty into a cisternlike box under it, Fig. 221. In this box the sediment will settle while the water overflows from it into the drain. Without such a box, the sediment will be carried into and may clog the drain. The box is to be emptied occasionally, before the sediment overflows. In order that the tool may be ground accurately, there are various devices for holding it firmly and steadily against the stone. A good one is shown in Figs. 221 and 222. This device is constructed as follows: A board A is made 2″ thick, 6″ wide, and long enough when in position to reach from the floor to a point above the level of the top of the stone. It is beveled at the lower end so as to rest snugly against a cleat nailed down at the proper place on the floor. The board is held in place by a loop of iron, B, which hooks into the holes in the trough of the grindstone. In the board a series of holes (say 1″ in diameter) are bored. These run parallel to the floor when the board is in place, and receive the end of the tool-holder. The tool-holder consists of four parts: (1) a strip C, 1½” thick, and as wide as the widest plane-bit to be ground. The forward end is beveled on one side; the back end is rounded to fit the holes in the main board A. Its length is determined by the distance from the edge of the tool being ground to the most convenient hole in A, into which the rear end is to be inserted. 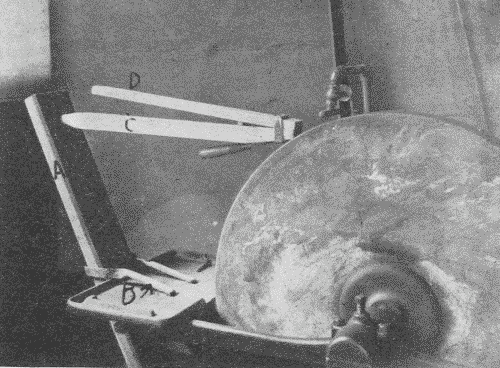 It is better to use as high a hole as convenient, so that as the grindstone wears down, the stick will still be serviceable; (2) a strip, D, of the same width as A and ⅞” thick, and 15″ to 18″ long; (3) a cleat, E, ⅝” × ¾”, nailed across D; (4) a rectangular loop of wrought iron or brass, F, which passes around the farther end of the two strips, C and D, and is fastened loosely to D by staples or screws. Fig. 223. Holder for Grinding Chisels or Plane-Bits. The tool to be ground slips between this loop and the strip C, and is held firmly in place by the pressure applied to the back end of D, which thus acts as a lever on the fulcrum E.
Any desired bevel may be obtained on the tool to be sharpened, by choosing the proper hole in A for the back end of C or by adjusting the tool forward or backward in the clamp. As much pressure may be put on the tool as the driving belt will stand without slipping off. A still simpler holder for the plane-bit only, is a strip of wood 1½” thick and 2″ wide, cut in the shape G shown in Fig. 223. The plane-bit fits into the saw-kerf K, and in grinding is easily held firmly in place by the hand. By inserting the rear end of the stick G into a higher or lower hole in the board A, any desired angle may be obtained. G is shown in position in Fig. 221. All such devices necessitate a perfectly true stone. The essential features are, to have a rigid support against which the tool may be pushed by the revolving stone, to hold the tool at a fixed angle which may be adjusted, and to press the tool against the stone with considerable pressure. The wheel should revolve toward the edge which is being ground, for two reasons. It is easier to hold the tool steadily thus, and the danger of producing a wire edge is lessened. The edge as it becomes thin, tends to spring away from the stone and this tendency is aggravated if the stone revolves away from the edge. If the stone does not run true and there is a consequent danger of digging into the stone with the tool which is being sharpened, the stone would better revolve away from the edge. The grinding should continue until the ground surface reaches the cutting edge and there is no bright line left along the edge. If the grinding is continued beyond this point, nothing is gained, and a heavy wire edge will be formed. A very convenient and inexpensive grinding tool, Fig. 224, sold as the “Agacite grinder,”7 has a number of different shaped grinding stones made chiefly of carborundum. Footnote 7: Made by the Empire Implement Co., Albany, N. Y. The oilstone. After grinding, edge tools need whetting. This is done on the whetstone, or oilstone. The best natural stones are found near Hot Springs, Arkansas. The fine white ones are called Arkansas stones, and the coarser ones Washita stones. The latter are better for ordinary woodworking tools. The India oilstone, an artificial stone, Fig. 77, cuts even more quickly than the natural stones. It is made in several grades of coarseness. The medium grade is recommended for ordinary shop use. Oil is used on oilstones for the same purpose as water on a grindstone. When an oilstone becomes hollow or uneven by use, it may be trued by rubbing it on a flat board covered with sharp sand, or on sandpaper tacked over a block of wood. Slipstones, Fig. 225, are small oilstones, made into various shapes in order to fit different tools, as gouges, the bits of molding-planes, etc. 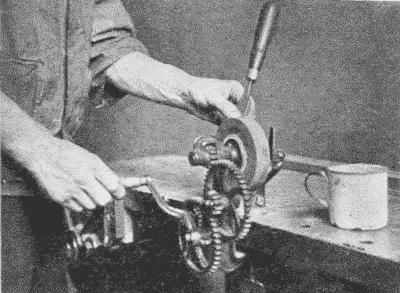 Files are used for sharpening saws, augers, scrapers, etc. See above.